Our CNC department is set up for both volume and quick turnarounds. 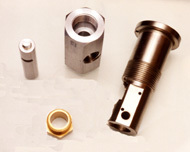 Modern equipment combined with experienced and skilled machinists means quality products on time. Left: Combination screw machine/CNC products. 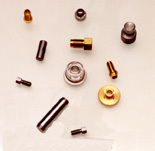 Above: Machine parts from Perry Screw Machine. 1- Star Swissturn w/ barfeed and 3/4" round capacity. 1 -Okuma Machining w/ Auto Index, Semi 4th Axis, adaptable to any mill - 20x 40"